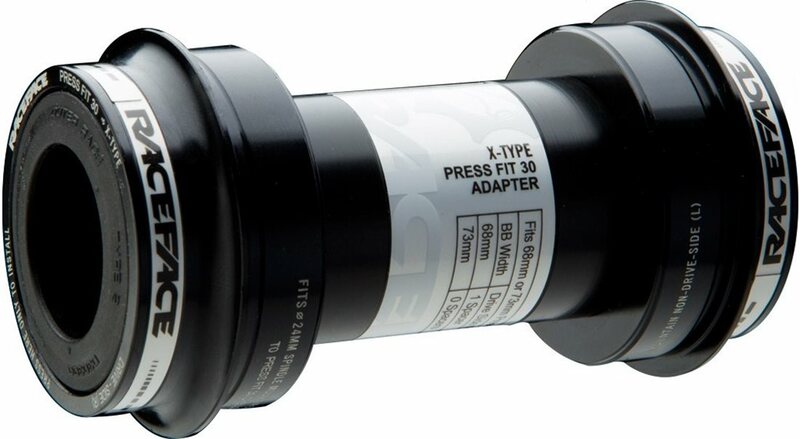 The PF30 bottom bracket adapter from Race Face lets you use all Race Face, Shimano and select FSA 24mm spindle mountain cranksets in frames that use the PF30 BB shell standard. MTN cranksets in PF30 BB Shell Frames. Press-fit bearing cups works like an external type bottom bracket. Much better than plastic PF30 adapters! I got this BB/adapter in order to use my Shimano cranks with my Epic 29er build. The aluminum cups are better fitting than the plastic cup adapters. There's less chance of the cups shifting out of place. The bearings are also serviceable. Solid fit! Way better than plastic cups! I bought this bottom bracket to use with my Shimano cranks. Way nicer than using a standard PF 30 with the plastic cups. Just press it in, install your cranks and your ready to ride! I used this with my Shimano XT Hollowtech 2 crankset works very well together. Jenson USA has great customer service. If you do your research first, you shouldn't need this product. If you're like me and buy a bunch of low cost parts that don't work together, this is a lifesaver. can i use this on my stance 27.5 2018 with SHIMANO XT FC-M8000-1 CRANKS? BEST ANSWER: It works well on my niner jet 9 rdo.